‘Undone science’ is a term used to describe areas of research that are left unfunded, incomplete, or generally ignored but which social movements or civil society organizations often identify as worthy of more research. This article draws on recent studies to elaborate the concept of undone science as it relates to the political construction of research agendas. 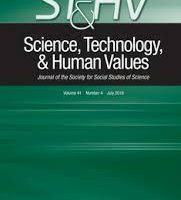 The authors develop the argument that undone science is part of a broader politics of knowledge, wherein multiple and competing groups struggle over the construction and implementation of alternative research agendas.